Fluke FoodPro Plus IR Thermometer Key features •	Two-in-one infrared thermometer for foodservice •	Combines an infrared non-contact thermometer for surface scans with a probe thermometer for internal temperature readings •	Features an integrated countdown timer with alarm that monitors line checks as well as cooking and cooling intervals •	Provides a built-in fold-out probe for measuring internal food temperatures Product overview Fluke FoodPro Plus food safety thermometer measures both internal and surface temperatures with one handy tool The Fluke FoodPro Plus thermometer provides a complete temperature measurement and monitoring solution for foodservice professionals. Use the FoodPro Plus to quickly and accurately measure food product temperatures to help detect potential food safety problems. It combines the same infrared surface temperature scanner as the FoodPro, and adds to it a fold out probe thermometer for measuring internal food temperature, and an integrated countdown timer for complete inspections of food temperatures and monitoring cooking and cooling intervals. Like the FoodPro, the FoodPro Plus thermometer is hand-washable and features unique HACCP check lights, which immediately indicate safe or potentially unsafe holding temperatures with either green or red lights. 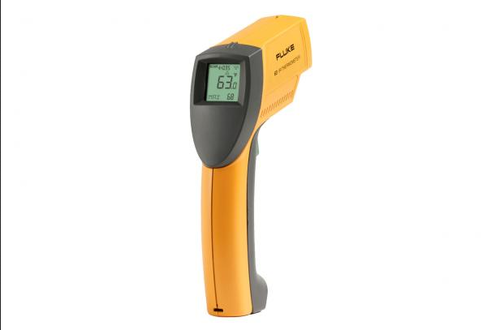 The Fluke FoodPro Plus is useful for: •	Receiving: Use the FoodPro Plus thermometer to quickly verify proper temperatures of food products at the point of delivery as recommended by your HACCP program. •	Food holding: Easily monitor hot and cold food holding. HACCP check lights provide instant recognition of safe/unsafe temperatures •	Inspection: Conduct food line inspections daily to ensure compliance with local food temperature monitoring requirements •	Equipment Calibration: Verify proper operating temperature of coolers, freezers, grills, fryers, warmers, as well as hot and cold storage units to avoid inconsistent food service, costly spoilage and to allow quicker response, reducing equipment repair costs •	Dining room: Easily verify temperatures in every aspect of food serving to ensure safety, enhance quality and reduce waste •	Measures -35 to +275 °C (-31 to 527 °F) with non-contact thermometer and from -40 to 200ºC (-40 °F to +392 °F)with probe •	Features backlit display for clear readings in poorly lit areas •	Displays MAX temperature for quick reference Specifications Infrared Specifications Temperature	-35°C to 275°C Accuracy	(Assumes ambient operating temperature of 23°C ±2°) Between 0°C and 65°C: ±1°C Below 0°C: ±1° ±0.1 degree/degree Above 65°C: ±1.5% of reading Response time	< 500 ms after initial reading Spectral response	8-14 microns Emissivity	Pre-set for foodservice applications Distance to spot size/Optical resolution (D:S)	2.5:1 @ 90% energy, typical Typical working range (target illumination)	≈ 25 mm to 250 mm Minimum target size	12 mm ø Illumination to IR channel offset	13 mm Probe Specifications Temperature	-40°C to 150°C Accuracy	(Assumes ambient operating temperature of 23°C ±2°) Between –5°C and 65°C: ±0.5°C Below –5°C: ±1°C Above 65°C: ±1% of reading Response time	7-8 seconds (3 time constants) Probe dimensions	Diameter: 3.0 mm Length: 90 mm Sensor type	Thin-film platinum, class A, Resistance Thermal device (RTD) Operational Specifications Repeatability	Within accuracy specifications of the unit Ambient operating range	0°C to 50°C Relative humidity	90% (±5%) RH non condensing @ 30°C Storage temperature	-20°C to 60°C Weight	150 g (with battery) Dimensions	165 x 32 x 50 mm Power, battery life	9 V alkaline Battery life	Alkaline, 10 hours minimum @ 23°C Target illumination	High brightness LED Display resolution	4 digits, 0.1°C Displayhold (7seconds)	Yes LCD backlit display	Yes Temperature display	4 digits, 0.1°C resolution Maximum temperature displayed	Yes Timer	Yes Environmental data	IP54 sealing (hand-washable, non-submersible) Other Specifications (both) Calibration certificate	Calibration accuracy with NIST and DKD traceability Standards	Conforms to EN 61236-1 Electromagnetic Emissions and Susceptibility, EN 6101-1 General Safety, Sealing IP54 (hand washable, non-submersible) Certifications	CE NSF Warranty	2 years Options/Accessories	Replacement probe At calibration geometry of 279 mm with a 140 mm diameter, 0.97 emissivity blackbody. Specifications subject to change without notice. Fluke FoodPro Infrared Food Thermometer Key features •	Highly accurate non-contact infrared thermometer that instantly measures surface temperatures of food products •	Allows taking rapid and frequent non-contact temperature measurements without risk of cross contamination •	Measures temperatures from -35 to 275°C •	Features HACCP check lights for instant recognition of safe/unsafe temperatures Product overview Fluke FoodPro non-contact thermometer provides the first line of defense against improper food handling The handy Fluke FoodPro pocket infrared safety thermometer provides a complete temperature measurement and monitoring solution for foodservice professionals. It provides the first line of defense against improper receiving, storage, and holding temperatures. The highly accurate FoodPro uses infrared technology to quickly read surface temperatures. 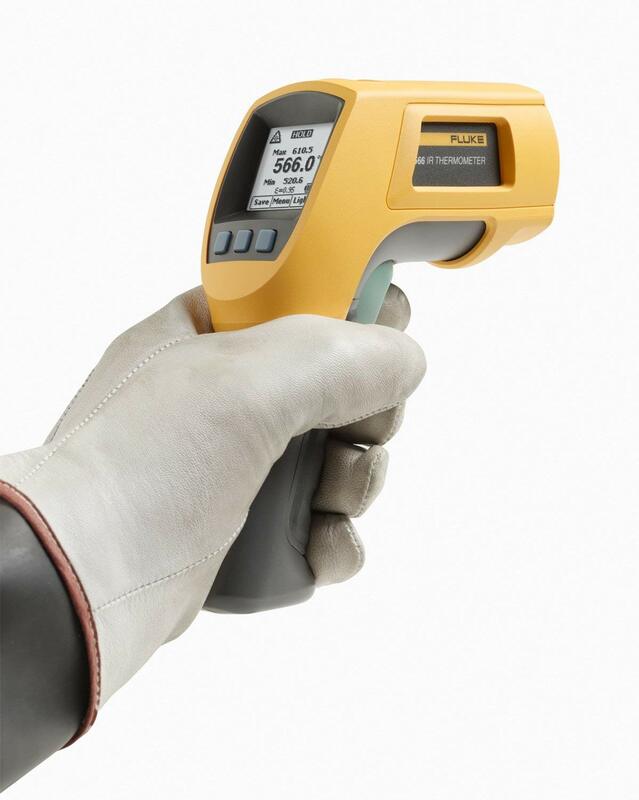 This allows workers to make rapid and frequent temperature measurements faster than with contact thermometers and without fear of cross contamination. 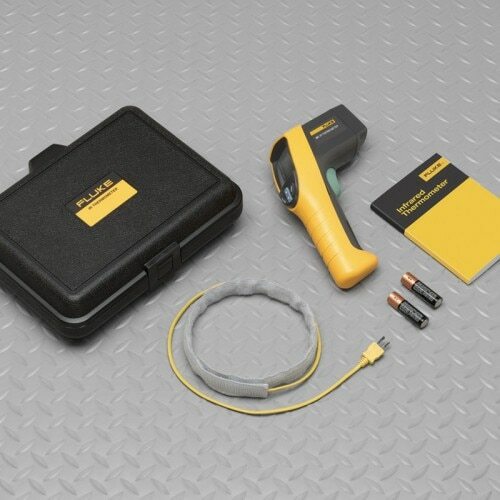 The easy-to-see illumination light shows you the measurement area. The FoodPro is a great help for: •	Receiving: Use the FoodPro thermometer to quickly verify proper temperatures of food products at the point of delivery as recommended by your HACCP program •	Food holding: Easily monitor hot and cold food holding. HACCP check lights provide instant recognition of safe/unsafe temperatures •	Inspection: Conduct food line inspections daily to ensure compliance with local food temperature monitoring requirements •	Equipment Calibration: Verify the proper operating temperature of coolers, freezers, grills, fryers, warmers, as well as hot and cold storage units to avoid inconsistent food service, costly spoilage and to allow quicker response, reducing equipment repair costs •	Dining room: Easily verify temperatures in every aspect of food serving to ensure safety, enhance quality and reduce waste •	Provides LED target illumination to highlight the entire measurement spot for accurate targeting •	Is hand washable (IP54 sealed) Specifications Infrared Specifications Temperature	-30°C to 200°C Accuracy	(Assumes ambient operating temperature of 23°C ±2°) Between 0°C and 65°C: ±1°C Below 0°C: ±1° ±0.1 degree/degree Above 65°C: ±1.5% of reading Response time	< 500 ms after initial reading Spectral response	8-14 microns Emissivity	Pre-set for foodservice applications Distance to spot size/Optical Resolution (D:S)	2.5:1 @ 90% energy, typical Typical working range (target illumination)	≈25 mm to 250 mm Minimum target size	12 mm ø Illumination to IR channel offset	13 mm Operational Specifications Repeatability	Within accuracy specifications of the unit Ambient operating range	0°C to 50°C Relative humidity	90% (±5%) RH non condensing @ 30°C Storage temperature	-20°C to 60°C Weight	100 g (with battery) Dimensions	150 x 30 x50 mm Power, battery life	1 AA alkaline Battery Life	Alkaline, 10 hours minimum @ 23°C	Target illumination	High brightness LED	Display resolution	4 digits, 0.2°C	Displayhold (7seconds)	Yes	LCD backlit display	No	Temperature display	4 digits, 0.2°C resolution	Maximum temperature displayed	No	Timer	No	Environmental data	IP54 sealing (hand-washable, non-submersible)	Other Specifications	Standards	Conforms to EN 61236-1 Electromagnetic Emissions and Susceptibility, EN 6101-1 General Safety, Sealing IP54 (hand washable, non-submersible)	Certifications	CE NSF	Warranty	2 years	At calibration geometry of 279 mm with a 140 mm diameter, 0.97 emissivity blackbody. Specifications subject to change without notice. TYGON - Laboratory Tubing - Part No-ACF00010 - ID x OD inch - 5/32 x OD 9/32 - ID x ODmm - 3.97 x OD 7.1 Details: Tygon Laboratory Tubing Details: Crystal clear and flexible. Tygon Laboratory Tubing handles virtually all inorganic chemicals found in the lab. It is non-oxidising and non-contaminating. This tube can be autoclaved and is flexible even at -43°C. Durometer hardness Shore A55. Can be used with condensers, incubators, gas lines, drain lines, etc. TYGON - Laboratory Tubing - Cat no-730060 - Part No-ACF00036 - ID x OD inch - 1/2 x 5/8 - ID x ODmm - 12.7 x 15.9 Details: Tygon Laboratory Tubing Details: Crystal clear and flexible. Tygon Laboratory Tubing handles virtually all inorganic chemicals found in the lab. It is non-oxidising and non-contaminating. This tube can be autoclaved and is flexible even at -43°C. Durometer hardness Shore A55. Can be used with condensers, incubators, gas lines, drain lines, etc.